The Australian Youth Climate Coalition seems a formidable bunch. Its leaders, for example, use their vast membership roll as a weapon, such as badgering the Big Four coal-lending banks “on behalf of 110,000 young Australians”. The number dwarfs membership of the Liberal Party, about 80,000, and the Labor Party, 54,000. But there is something odd about this membership roll, which the 2014 annual report puts at 120,000. First, it’s free to join. The Liberals charge $35 (concession) to $100 pa in Victoria, while Labor in Victoria collects dues of between $34 (concession) and $224. The Institute of Public Affairs, with 3500 members, charges $88. Second, AYCC is pretty cavalier about the particulars of each member. Determined “to stand up for my future”, I joined online by providing name, email, age (a youthful 74), phone and state. That’s it. They don’t even want my address. The process took me half a minute. Just for interest, I joined successfully a second time — AYCC software accepts duplicate memberships. ”, so I enrolled her, successfully, with AYCC. I assume both of us are now members forever, since there would be no point in AYCC reminding us about free annual renewals. What proportion of AYCC “members” since 2007 are bounce-back phantoms? While “member numbers” are useful for AYCC propaganda, AYCC focuses internally on its “volunteers” (currently 2100) who proselytise in schools, jump about in fish suits, and help run AYCC events. As ACT coordinator Emma tells, “We often race to Parliament House for rapid response media stunts. There is never a dull moment in Canberra!” WA coordinator Dean writes, “We have group (sic) at the University of Western Australia as well as several local groups.” Group at UWA was doubtless active in lighting the auto-da-fé for climate heretic Bjorn Lomborg on the campus this month. What’s also noteworthy is that the 110,000-strong AYCC can claim only ‘several’ local groups in WA (pop 2.6m). Victoria manages about 20 local groups. Tasmania has two. The 2013 annual report gives more detail (p20). It says there were 600 volunteers in 100 local groups (an average six per group), including 80 ‘active’ volunteers in Victoria, and 50 ‘active’ in Queensland. Other states didn’t specify ‘active’ or other volunteer numbers. AYCC’s national campaigner and media person Daniel Spencer says “volunteers” commit to give time to AYCC weekly. Is it rude to ask what would happen to AYCC’s 110,000 membership if AYCC were to seek even a token $10 membership fee? Might membership collapse to, say, 5000-10,000, a modest multiple of the 2100 AYCC volunteers as of last December? By analogy, the Institute of Public Affairs ‘young member’ category, charging $22 for under 25s, has only 220 members. AYCC is spawn of the US Energy Action Coalition (EAC) of 50 youth-led environmental groups. EAC is a prominent member of Al Gore’s Alliance for Climate Protection. Anna Rose, after attending the UN Montreal climate fest in 2005, templated the AYCC’s first constitution on the EAC’s. In 2008, young UK activists set up their own coalition based on EAC and AYCC. AYCC operates out of Carlton, having moved from its original office in the Trades Hall. It proclaims, like similar lobbyist groups, that it is politically non-partisan. This is important for maintaining its ‘charity’ status. Its policies are way to the left of the Labor Party and dovetail in their extremism with the Greens’ worldview. Among the AYCC online resources for teachers is a video to show to students, “How to Talk About Climate Change”. At 50 seconds, a girl and boy stroll past three prominent posters on a fence: two of “This Time, I’m Voting Greens” and “Vote 1 Adam Bandt: The Greens”. (AYCC’s Spencer swears the posters must have got in the shot inadvertently). With a hung Federal Parliament after the 2010 election, they got to work on the two rural Independents. Sheikh, wearing his GetUp hat, enlisted “an international [climate] expert who can never be named” [at 52 minutes] to come to Australia as chief persuader and this expert, he says, swung the two rurals to the Julia Gillard camp. In other words, if you accept his version, Sheikh is saying an anonymous foreigner was midwife to the Gillard minority government. Who was that man? The previous year, Sheikh and Rose along with Greenpeace and others, had enticed Al Gore to their Power Shift conference in Sydney. In 2014, ”Nobel Laureate” Gore was again meddling in Australian politics, arriving in person to back Clive Palmer’s PUP group of key senators. It’s hard to imagine any foreign climate guru, other than Gore, with the clout to install Gillard as Prime Minister in 2010, but I can’t find any reference to a Gore visit that year. Nor does Paul Kelly’s Triumph and Demise mention it. Unwary and non-plussed people in political and business circles might think of AYCC as nothing more than a bunch of excited, idealistic kids who enjoy dressing up as koalas. Many are, but AYCC is led by smart and dedicated lobbyists determined to see the imposition of economy-busting carbon dioxide controls. As with Tupperware and the Al Gore education circus, savvy AYCC leaders train sub-leaders and sub-leaders train local leaders in a cascade of enthusiasm that flows down to the grassroots. In media nous, AYCC leaders make the Greenpeace publicity tarts look like amateurs – an AYCC coach can tell you that an ideal TV soundbite involves 27 words and three thoughts, and should be no more than eight to nine seconds. One of the AYCC’s 2009 media stunts was “a flash mob with 2,000 young people on the steps of the Opera House.” I noticed that other friendly estimates of the dance mob talked about ‘hundreds’ and the semi-official Essential Media video said ‘over 800’. The video captures the flash-mob on the steps and by freezing it at 4.37mins, I could count a maximum 650. AYCC’s Spencer says there were more than 1000 at the Sydney conference, of which the flash-mob dance was a part. 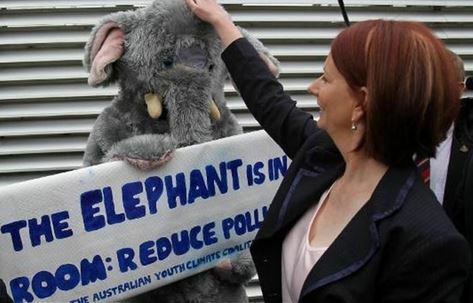 For the 2010 federal election, AYCC must have bought up every elephant suit in Australia (and home-made more of them) to confront politicians (below) with the supposed climate-change ‘elephant in the room’. For their campaigning against North Queensland coal port development (‘saving’ the Barrier Reef) they have “Nemo” clownfish suits. Lend Lease was Nemo’s first victim, cravenly opting out of Abbott Point coal-loading financing last year. Co-founder Rose and ex-leader Lucy Manne have not merely cherry-picked the Obama campaigning techniques; they campaigned for “Camp Obama” in 2008 and 2012 respectively. They know the power of the maudlin and air-brushed “personal stories” used by Obama. Rose proffers as her own story (ad nauseum) that climate change is real and upon us because her grandparents had to sell their Gunnedah farm in the 1990s drought, which was ‘the new normal’ (as if Australia never had droughts!). When the drought was terminated by floods, she blamed them on climate change as well. The AYCC’s Spencer says it is an equal-opportunity organisation “and it is exactly because of this we strongly support women’s leadership. Our membership and volunteer base is majority female. 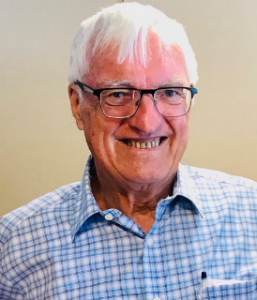 Females are strongly represented in non-government organisations across the board.” Males do hold senior roles, he says, noting that he has been AYCC’ spokesman for three years. Rose’s road to activism began in primary school, when her teachers “educated” her about climate catastrophism. By age 14, after listening to a Wilderness Society campaigner at the school assembly (more green brainwashing during school hours), she was a full-blown militant who prodded her principal to include “environmental activities…writing passionate, handwritten letters to politicians” as “a new official school sport”. Next year, she led a walkout from science class because of mice dissection, and she abandoned science subjects thereafter. “I have expert, objective, scientific consensus on my side and a sound knowledge of basic climate science facts,” she writes in her aptly titled book Madlands. Among the factoids she recycles are that climate change will drop Murray Darling farm output by between 92% and 97% in 2100; that climate change is blameworthy for Hurricane Katrina, Russian droughts and US wildfires; that Michael Mann’s Hockey Stick data is “solid”, and that natural climate variability is “quite well understood, scientifically”. Rose and McKenzie are both Law Honors graduates. McKenzie ran AYCC with Rose for a couple of years, then moved on to run PR for Labor’s Flannery-led Climate Commission. She stepped up in 2013 to become co-founder and CEO of the crowd- and millionaire-funded Climate Council. Rose on hitting an internal age-27 ceiling, became AYCC chair in 2010. She moved off in February, 2013, to educate ANU students as lecturer on ‘Leadership & Influence’, and this year was in WWF, running Earth Hour. In Part II: AYCC infiltration of schools, its business connections and tycoon-backed finances. For good measure, we joined AYCC’s sister crowd GetUp as well, swelling their “membership” from 918,071 to 918,073. WWF Australia is similar to AYCC in offering free membership. It has 80,000 “members” who get WWF emails, but unlike AYCC, WWF’s 2014 annual report doesn’t even mention member numbers. The Institute of Public Affairs, likewise, has no formal links with the Liberal Party. The extent to which charities can campaign politically, was a grey area but the High Court’s upholding of lobbyist AidWatch as a charity in 2010 gave a green light to “charity” campaigning groups. The Liberal’s Peter Costello when Treasurer made a push to tighten the ‘charity’ status of political lobby groups but gave up. As described by then PUP senator Glenn Lazarus. Gore actually won half of a Nobel Peace Prize, as did Yasser Arafat a decade earlier. A less likely contender could be NASA’s James Hansen, another pal of Rose and Sheikh. Rose’s chapter on climate change in ‘The Future, By Us’ was described as ‘authoritative’ by The Age. McKenzie’s thesis, which through no fault of hers has not stood the test of time, was “the integration of an Australian emissions trading scheme into the global carbon market.” Monash, High Distinction. Rose did a first class honours degree in Arts (Asian Studies) and Law (Sydney), and further work at Cornell Law School. A 2012 AYCC document says, “All staff members and volunteers are under the age of thirty. The board must also include a majority of people under the age of 30.” That rules me out as a volunteer, but I would still be eligible for the board. The Children’s Crusades against the Saracens ended well for them. Saved the Reef, do these sheeple realise there’s a more extensive coral reef off the coast of Western Australia and it’s not suffering degradation due to Gullible Warming. Global Warming is a multi million dollar industry that would be doomed if proven to be scientifically incorrect, so there is a huge vested interest in keeping the propaganda going, fuelled by the media and todays schools it seems to be nothing but a massive brain washing exercise and those scientists that dare to beg to differ on the subject are called ‘climate deniers,’ and many lose their positions for exposing global warming for the huge con that it truly is. It is a sad world where money and government agendas trump free speech and ridicule free thought. Forgot to mention that Ellen Sandell, ex-AYCC CEO-equivalent, is now Greens MLA for Melbourne.